V Now though we are sure of Charles' childhood story, we know next to nothing about Mystique when she was a little un. All we do know about her early years is that her real name is Raven Darkholme & that she learned to use her powers at a particularly early age (which WAS shown in the movie). So who knows? She may have had some history with some of the X-Men characters as a kid but it most certainly wasn't Professor X. Did it work? Seeing that we know nothing about here past, it is cool that this movie did somewhat flesh out her childhood & adolescence, however different it might've been from the comics Mystique. But now I guess the comics may put in elements of her movie past into the comic stories, just like how full black leather costumes were incorporated from the original trilogy & how the X-23 character that was essentially created for the X-Men Evolution cartoon series (that I love btw) came into comic existence too, as a clone of Wolverine's. VII Angel & Darwin were not at all even thought of in the 60's- forget existing! Angel first appeared on the X-scene in 2001 in New X-Men Vol.1 #118 & Darwin in 2006's X-Men: Deadly Genesis #2! And Angel was never a go-go dancer lol. Did it work? I think yes. Angel's stripper character fits well with the whole swinging 60s vibe they were looking for in the movie. Also the effect of her wings popping out of her tattoos is REAL cool! Darwin was a great character too. My only complaint is that both characters seem under-used especially Darwin! And why do I get the feeling that Angel may be the next one to die in the First Class sequel...? But one particular scene that irritates me is the dramatic way in which Darwin lifts his hand gesturing Angel to return back to the fold! It's like the director told him to act like he was in a LOTR movie- LAME! VIII Alex Summers (Havok) is actually Cyclops' younger brother. However the good thing here is that they have left the family relation ambiguous (to be explained in the sequel perhaps?). Also his costume was given to him by Larry Trask, son of Bolivar Trask (the Sentinels' inventor) & not Beast. In fact, Havok joined the X-Men much later in his life than shown in the movie. Did it work? Yes, again. Havok's a great character & many were looking forward to seeing him. They've changed the color of his plasma waves from blue (in the comics) to red, most probably to foreshadow his link to Cyke. So that's definitely a nice touch. And they have maintained his cocky, headstrong nature from the comics. IX Banshee was also another character who joined the X-Men late. This Irishman whose real name was Sean Cassidy (somehow I don't remember that name being used in the movie- correct me if I'm wrong), has always been a decade older than the other X-Men members & he hasn't remained on the team for long. Did it work? Yes. Another character that fans have been eagerly waiting for. And this guy had quite a chunky role (taking into consideration that it IS an X-Men film lol). The scene where he first gets his groove on in flying is pretty cool. 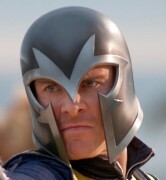 X And lastly- the origins of Magneto's helmet. Well, obviously you must've guessed that Shaw has nothing to do with him procuring a helmet, after reading about Shaw not being a part of Mags' comics evolution as in the movie. After surviving the destruction of his mutant nation Genosha, Erik fled to China & took up the alias Xorn- a mutant healer having an deformed head that needed to be concealed in a metal "mask" which happens to be his telepathy-proof helmet. So wotchya think? Agree? Or do we only agree to disagree? :P Can you think of more gaffes? Then do sound off in the comments! I have just installed iStripper, so I can watch the sexiest virtual strippers get naked on my desktop.